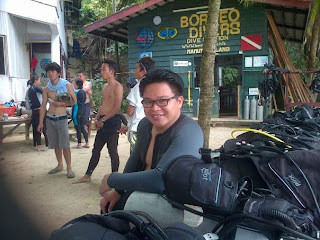 A Diver from The Land Below The Wind, North Borneo: Safety Stop Blog is just started. Hi everyone. How do you guys doing? I just got my diving licence few month ago with two of my buddies, Cassandra and Oscar. I took the course from Borneo Divers Training Institute Kota Kinabalu and i would like to say that Borneo Divers is the BEST. Good management, good staff and very friendly. Well, diving is a recreational sport and very interesting because what we see in-front of our eyes in land is actually different with the underwater world. Just imagine a beautiful and colorful park with lots of blooming flowers , butterfly and bird flying just few inch near you like you can just touch it.. Well underwater world is actually more beautiful with lots of weird creatures. I just can't explain it. Some of us might don't know how to manage anger and stress. Yes indeed, to many task to do in the office. Sometimes, we need to stay back to finish the task. This is my advice, take a leave ( maybe you can take a sick leave/emergency leave as well as i do always hahahaha) and go diving! Please believe me that your stress will swiped with the sea water! But you must be a certified diver first.. This blog is created for my diving diary. So stay tune!